Nestling in the curvaceous mountain ranges of the western ghats of Maharashtra is the cool misty resort of Mahabaleshwar. Away from the crowds and noise of the city, the resort is an ideal holiday destination. Mahabaleshwar seem to belong to the colonial era when people traveled up to the resorts to escape the heat of the plains. It still retains some of the old world charm and make an ideal holiday destination. Among the hill resorts of the state, Mahabaleshwar is very popular. Tucked away in the Satara district, it is best approached from Pune. Spared the commercialisation that has affected the hill resorts of north and south India, the resort offers a clean, calm and thoroughly refreshing alternative. The summer capital of the erstwhile Bombay Presidency, Mahabaleshwar retains its quintessential charm, despite the increasing crowds that visit the town. Numerous majestic mansions built during the days of the British, still stand as monuments of the Raj. Overlooking the Krishna and Koyna valleys, Mahabaleshwar, at an altitude of 1372 meters opens up a whole world of picturesque delight. With an air of unspoilt beauty, it is a paradise for nature explorers and peace lovers, as also for filmmakers and producers. Best time to visit Mahabaleshwar is October to June. The monsoon months must be avoided to plan your visit to Mahabaleshwar. Cotton clothing is ideal all through the year. Nestling in the curvaceous mountain ranges of the western ghats of Maharashtra is the cool misty resort of Mahabaleshwar. Away from the crowds and noise of the city, the resort is an ideal holiday destination. Mahabaleshwar seem to belong to the colonial era when people traveled up to the resorts to escape the heat of the plains. It still retains some of the old world charm and make an ideal holiday destination. On the way to Mahabaleshwar from Pune, Panchgani is a picturesque little town in the shade of groves of casuarinas and silver oak. Protected from harsh winds by a tableland on one side and high cliffs descending into a valley on the other, Panchgani has a pleasant, bracing climate throughout the year. Panchgani is also an ideal base for some good trekking from where one can explore several mule tracks that lead through the now thinning forests. The hill resort of Mahabaleshwar is easily accessible from the other important cities of India besides the other cities of Maharashtra. The excellent road network, railway system and the air linking make Mahabaleshwar a popular travel destination of western India. You may take your pick from a range of holiday resorts and tourist bungalows in Mahabaleshwar besides the star categorized accommodation options around the landmarks of Mahabaleshwar offer excellent view of the landmarks through their suites. Most of the places to stay in Mahabaleshwar are strategically located near the tourist attractions of the hill resort. Indian visit can book reasonably priced bungalows, holiday resorts and hotels for you in at Mahabaleshwar. Planning a weekend trip to Mahabaleshwar or enjoying your holidays? Check out the following all-inclusive tour packages and holiday offers that will make your travel trip to Mahabaleshwar comfortable and enjoyable. We provide a range of tour packages and holiday offers for the hill resort of Mahabaleshwar that will suit your requirements and budget. As per the nature, duration and the accommodation required during the holiday trip or excursion to Mahabaleshwar the tour packages vary. Wilson Point is the nearest and the highest point in Mahabaleshwar. It is a vast bare rock with three observation towers erected at different spots. It is a major attraction for tourists as it offers a beautiful view of the sunrise. 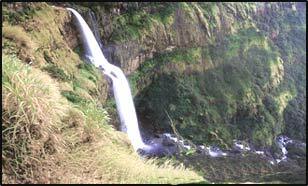 Babington point, two kilometers from the bazaar offers a beautiful view of the Koyna valley and Chinaman’s waterfall. Helen’s point is about a kilometer’s ride from here by the Blue Valley Road. It takes one into the midst of the valley and gives an enchanting view of tiny fields and neat little huts. 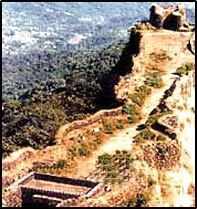 Bombay point is one of the earliest known points in Mahabaleshwar. Every evening visitors rush to the peak to get a spectacular view of the sunset. From the peak, one can also see Pratapgarh and Makrandgarh at their best. Connaught peak and Hunter Point are situated off the Old Mahabaleshwar Road. Connaught Peak is the second highest peak of these hills. 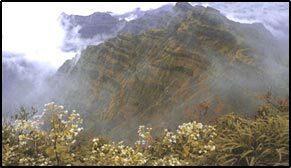 It offers a panoramic view of the Vena Lake and Krishna Valley. It was first known as Mount Olympia, and was a favorite spot for riders. The Duke of Connaught was so enchanted by its majestic view that he could not resist the temptation of associating his name with the spot. Hence in 1880, Mount Olympia became Connaught Peak. From here one can see Old Mahabaleshwar and Elphinston Point to the north; Pandavgad and Krishna Valley to the east. Hunter’s point approached from Old Mahabaleshwar Road, gives a picturesque view of the Koyna Valley. On the way to Arthur’s Seat one comes across Elphinston, Marjorie and Savitri Points and also Castle Rock. The cliffs at these points rise from the Konkan Valley, which are some 500 meters below the level of the Koyna Valley. The ravine between these points is the rise of Savitri River which rushes down 700 meters straight from here. Favorite picnic spot, Elphinston Point, named after the Governor of Bombay, Sir Elphinston, was discovered by Dr.Murray in 1830. Arthur’s Point, named after Arthur Malet, is Mahabaleshwar’s most famous point overlooking the densely forested valley. It is interesting from this point, to watch a straw hat or a handkerchief, tossed down, sailing attractively in the air like a spread-out parachute! While going to Arthur’s Seat, one comes across a small stream called the Tiger Spring. Till this day people believe that tigers and panthers frequent this place to quench their thirst. Lodwick Point is named after a General who reached this point in 1824. He was the first European to set foot on the Mahabaleshwar hills. A monument at the top of the promontory has been erected in his memory. Beyond Lodwick Point is the extreme end of the mountain range known as Elephant’s Head. It is only 12 feet to the Koyna Valley below. From Lodwick’s point, the overhanging cliff looks like an elephant’s head and trunk, and hence the name. Kate’s point on the Mahabaleshwar-Pune road, gives a commanding view of the Krishna Valley. Near Kate’s point is the Echo Point, which, true to its name, echoes the words of the speaker. On the way to Mahabaleshwar from Pune, Panchgani is a picturesque little town in the shade of groves of casuarinas and silver oak. Protected from harsh winds by a tableland on one side and high cliffs descending into a valley on the other, Panchgani has a pleasant, bracing climate throughout the year. Panchgani is also an ideal base for some good trekking from where one can explore several mule tracks that lead through the now thinning forests. A visit to Pratapgad Fort, 24 kilometers from Mahabaleshwar, adds a historical dimension to the Mahabaleshwar-Panchgani holiday. 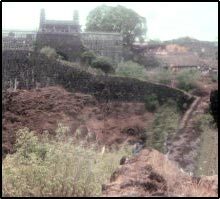 Made famous by the Maratha leader Shivaji, the fort built in 1656, saw a decisive encounter between him and Afzal Khan, a general sent by the ruler of Ahmednagar to subdue the rebel. Afzal Khan was killed in the clash and Shivaji established himself as a significant force in the contemporary power politics. Planning a weekend trip to Mahabaleshwar or enjoying your holidays? Check out the following all-inclusive tour packages and holiday offers from Mumbai to Mahabaleshwar taxi by Cabs2go that will make your travel trip to Mahabaleshwar comfortable and enjoyable. We provide a range of tour packages and holiday offers for the hill resort of Mahabaleshwar that will suit your requirements and budget. As per the nature, duration and the accommodation required during the holiday trip or excursion to Mahabaleshwar the tour packages vary.